Free Shipping Included! Continental Art Center NL9701 Hand Painted Glass with Night Light Sea Turtle, 5.2 by 5.6 by 1.6-Inch by Continental Art at The Net Stores Network. MPN: NL9701. Hurry! Limited time offer. Offer valid only while supplies last. Hand Painted Glass Night Light-turtle. Manual on/off switch. Extensive Handcrafting Is Put Into Each Piece, stained glass and metal. 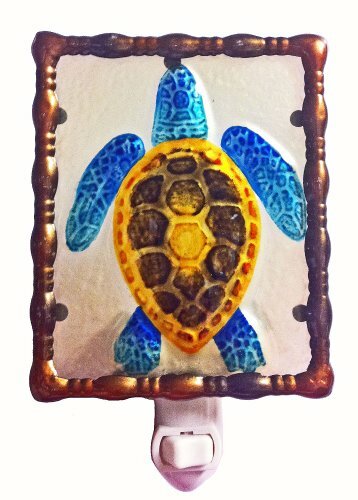 Hand Painted Glass Night Light-turtle. Manual on/off switch. Extensive Handcrafting Is Put Into Each Piece, stained glass and metal. Size:5.2"x5.6"x1.6". Extensive Handcrafting Is Put Into Each Piece, stained glass and metal. Exclusive designs: turtle. Manufacturer: Continental Art Center Inc. Publisher: Continental Art Center Inc. Studio: Continental Art Center Inc.
View More In Accent Lighting. If you have any questions about this product by Continental Art, contact us by completing and submitting the form below. If you are looking for a specif part number, please include it with your message.